...whether you eat or drink, or whatsoever else you do, do all to the glory of God. Be without offence to the Jews, and to the Gentiles, and to the church of God: As I also in all things please all men, not seeking that which is profitable to myself, but to many, that may be saved. Be ye followers of me, as I also am of Christ. What does St. Paul mean when he says "avoid giving offense", and that he tries "to please everyone in every way"? He wants to "be without offence" and hence strive "in all things to please all men." A cursory reading of this passage might suggest that he means we should avoid doing anything a person might find offensive. That, if a person is subjectively offended by something we are doing or saying, we have an obligation to cease that offensive behavior. Now, since there are all manner of things people could be offended by, this would include a very broad spectrum of human behavior and would necessitate a very intimate knowledge of the attitudes and preferences of the people one comes in contact with. It's mind-boggling to think of the degree of egg-shell-walking we would have to perform to keep St. Paul's command understood this way. In the minds of our progressive friends, this passage would mean we ought not to speak about the truths of the faith to somebody who might be offended by some aspect of them. These days, speaking about Catholicism to someone who is in disagreement with it is often considered inherently offensive. For example, speaking to a Muslim about Jesus Christ. Understood this way, the passage "avoid giving offense" is utilized in the same sense as "judge not" and "do not do your works before men" - that is, as objections to any vocalization of the faith which may be even remotely confrontational. However, St. Paul does not mean "avoid giving offence" in this sense. Let us look at three relevant Scripture passages. I think there are probably more, but three should be sufficient to make our case. First, if St. Paul meant that Christians are forbidden from ever subjectively offending anybody, it would be ridiculous for St. Paul to write in Romans 9:33 (citing Isaiah) that Christ is "a stone of stumbling and a rock of offence." If it is always wrong to give offence, then in what sense can Christ Himself be a "rock of offence"? Second, if the sense of Paul's words is that we ought to always make sure we are pleasing to men, how can he say in the Epistle to the Galatians, "do I now persuade men, or God? Or do I seek to please men? If I yet pleased men, I should not be the servant of Christ" (Gal. 1:10). Clearly St. Paul does not believe we are to always make certain we never offend anyone if he identifies a disposition of man-pleasing contrary to the servanthood Christ requires. Furthermore, when delivering the Sermon on the Mount, Christ says, "Blessed is he who takes no offense at me" (Matt. 11:6). Now, how can Christ admonish His listeners not to be offended by Him if, according to our progressive friends, it would be the responsibility of the speaker to make sure his hearers are not offended? This passage would make no sense; Christ acknowledges no responsibility on His own part to make sure His hearers are not offended by Him. Rather, He simply speaks the truth and tells His hearers it is their responsibility to not be offended by it. Given all this, how can St. Paul say "avoid giving offense"? Of course, the answer is that when St. Paul admonishes us to "avoid giving offence", he means we should avoid doing actions which are objectively worthy of offence. He does not mean that it is always our problem if somebody is subjectively offended by our words or deeds. Moderns forget that offense is not a totally subjective thing, even if they want to treat it as such. There are some things one is right to be offended about, other things one is wrong to be offended about. The objective cause of offense matters. One who is offended because of evil is rightly offended and has a kind of just anger; one who is offended because of the truth is in error, of which their offense constitutes a sort of evidence of their blindness. When St. Paul says we must avoid giving offense, he is essentially saying, "Do not commit evil deeds that people are rightly offended by." He is not saying, "It is your job to make sure no person you interact with is ever offended by you in any respect." That would be unworkable practically and contrary to the meaning of other scriptural passages that mention offense. This is related to St. Thomas' distinction between various types of scandal. We have an obligation to avoid scandalizing individuals through our sinful behavior, but it is not our concern if people are scandalized by righteous behavior, as the Pharisees were scandalized by the healings of Christ. In that case, such persons are actually guilty of their own scandal due to hardness of heart. Incidentally - and time for a little crass self-promotion - I have two chapters in my work Book of Non-Contradiction on similar arguments where progressives take passages and try to interpret them in ways to suggest Christians should keep their faith quiet or keep their opinions to themselves. Let's not forget St. Paul's "opportune et importune", either. 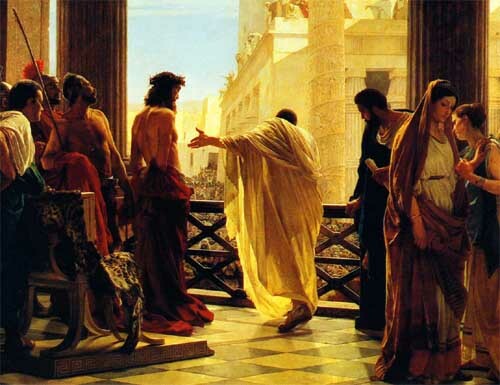 Considering how the Roman Empire reacted to Jesus and his followers as Enemies of the State, our very existence appears to be an offence to the world. I'm reminded by what Ben Shapiro said re. the Milo Yiannopoulos controversies: "(paraphrasing) Offending for the sake of offending is wrong. However, if others are offended by what you say because you are saying something good and true, then it's not you who are wrong."